All resources have been aligned with the NGSS! Here are 4 example Performance Expectations that are well supported by CLEAN resources. You can use the links below to explore resources that can be used to address the full breadth of each specific Performance Expectation, or select one of the connected Disciplinary Core Ideas to see topically related resources. MS-ESS3.D: Global Climate Change Human activities, such as the release of greenhouse gases from burning fossil fuels, are major factors in the current rise in Earth's mean surface temperature (global warming). Reducing the level of climate change and reducing human vulnerability to whatever climate changes do occur depend on the understanding of climate science, engineering capabilities, and other kinds of knowledge, such as understanding of human behavior and on applying that knowledge wisely in decisions and activities. MS-ESS3.C: Human Impacts on Earth Systems Typically as human populations and per-capita consumption of natural resources increase, so do the negative impacts on Earth unless the activities and technologies involved are engineered otherwise. ESS3.D: Global Climate Change Though the magnitudes of human impacts are greater than they have ever been, so too are human abilities to model, predict, and manage current and future impacts. HS-ESS3-2 Evaluate competing design solutions for developing, managing, and utilizing energy and mineral resources based on cost-benefit ratios. HS-ETS1.B: Developing Possible Solutions When evaluating solutions, it is important to take into account a range of constraints, including cost, safety, reliability, and aesthetics, and to consider social, cultural, and environmental impacts. Screenshot showing the position of the NGSS browse facets in the main CLEAN search interface. 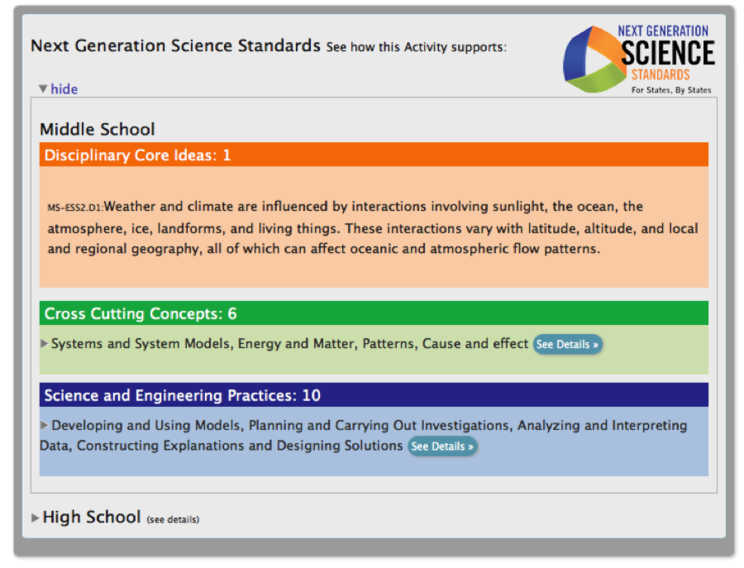 You can also explore the CLEAN resources that support other Performance Expectations and Disciplinary Core Ideas using the NGSS-specific search facets on the right side of CLEAN's main search page. How did we select these particular components? - enable a deeper understanding of a Disciplinary Core Ideas. The text and labels for each component are drawn directly from the published Next Generation Science Standards, with two additions. The published standards provide labels for the Disciplinary Core Ideas (e.g. ESS2.D) but these labels often encompass multiple bullet points. We've added a numeric suffix (reflecting the order in which the bullets appear in the standards) to indicate specific bullet points (e.g. ESS2.D1 or ESS2.D3). Likewise, the printed standards provide no labels for the Crosscutting Concepts or Science and Engineering Practices. So we've labeled these individual bullets to reflect the grade level and their order of appearance in appendices F & G of the standards. So HS-C6.2 refers to the 2nd bullet of the 6th of the Crosscutting Concepts at the High School level.